Update: Petland, Inc. is not involved in this lawsuit. As an independently owned and operated franchise, Petland El Paso is solely responsible for suing the rescue groups. In a move surely not approved by their PR team, corporate giant Petland El Paso is flexing its legal muscles and filing a lawsuit against a handful of animal rescue groups in El Paso, Texas. Southwest Collie Rescue, El Paso Great Dane Rescue, and Dr. Ken Okada, a board member for the El Paso Humane Society, are apparently such a threat to the $50 million company store that it feels the need to sue them for over $2.5 million. Why? Perhaps it’s because the El Paso city council actually did something good for animals. In an effort to reduce the number of dogs and cats euthanized in the city, they passed a new law which takes some minor steps toward regulating the pet trade. Why would anyone say Petland gets its dogs from puppy mills? Perhaps because it does get dogs from puppy mills. 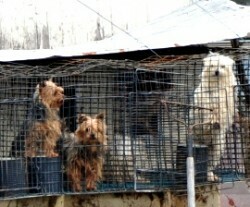 The HSUS estimates that over 95 percent of Petland stores are linked to the puppy mill industry. No wonder a federal judge issued a ruling allowing a lawsuit to proceed against the company based on allegations that the retail chain is routinely selling unhealthy puppy mill puppies to unsuspecting consumers. To make all of this clear: Petland El Paso wants people to buy ridiculously overpriced pedigreed pets from its store instead of adopting from a shelter so it can make a few extra bucks. When a the city takes some baby steps at regulating the pet trade and encouraging adoption, Petland El Paso gets all frothy at the mouth and decides to sue those all-powerful animal rescue volunteers who, by saying mean (yet true) things about Petland and puppy mills, might pose a tiny threat to its huge profits. The obvious lesson? Petland El Paso cares more about profiting from selling animals than about animals languishing in shelters. Tell Petland El Paso to stop suing animal rescue groups.